There are three other trailers roaming around but this trailer pretty much has the most “juicy” material. A few things you immediately notice. Colors. Anyone else realize how colorful the movie is? This is a new thing that many Anime’s have been doing, especially for movies. Bright colors attract the audiences attention more and make it look all “sparkly” for the big screen. However, to me it looks like I am playing Minecraft with the plastic texture pack enabled. It looks so fake and harsh to me. This may just be my own opinion but I truly can’t appreciate the colors. Notice anything right off? Well for me it was the eyes. Why all of a sudden is yogi becoming more like Yami Yugi? Granted I think that is the point. 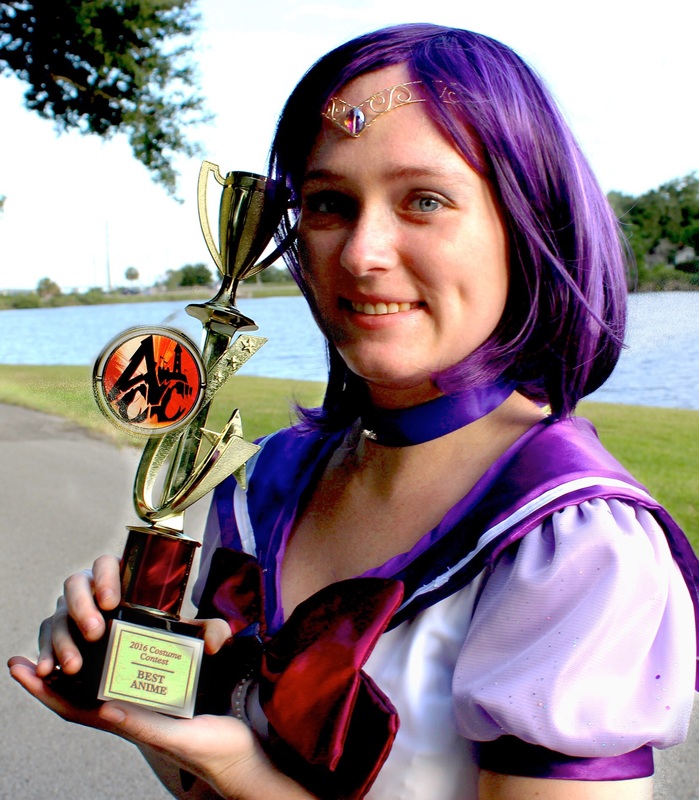 Yuri manages to find the strength within himself to defend himself and make friends and his darker half helped him reach this goal. So it is cool that he is kind of becoming his darker self to reflect this. However, let’s be clear. 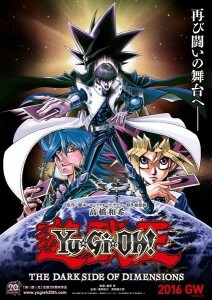 This movie takes place 6 months after the series ends and Yami Yugi is sent back to the afterlife. Six months…. I don’t care what type of meds Kaiba Corp. is creating your eyes don’t just change from innocent round ones to slanty harsh ones in six months. Only explanation is eye surgery. But seriously. Those slanty eyes are bothering me. Now there is a lot of glaring during card games so this will probably only bother me for the first part of the movie (card games always take place at the end of the movies it seems). <- See? This is fine. Glaring is fine. 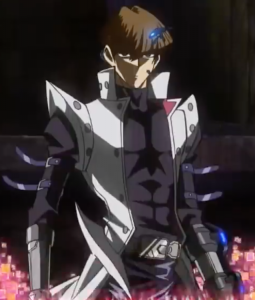 I guess since his arch rival finally left Seto Kaiba has been hitting the gym on an hourly bases. 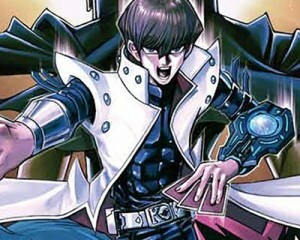 Even still though, Seto Kaiba is ripped! Six-pack and all (fan girls are swooning right now). His new look doesn’t bother me at all in the least. Besides his new muscular body and some more armor around his legs (not sure why) he is pretty much the same cold blooded man we have come to love. Good to know that 6 months later Yugi and Kaiba are pretty much wearing their same signature clothing. 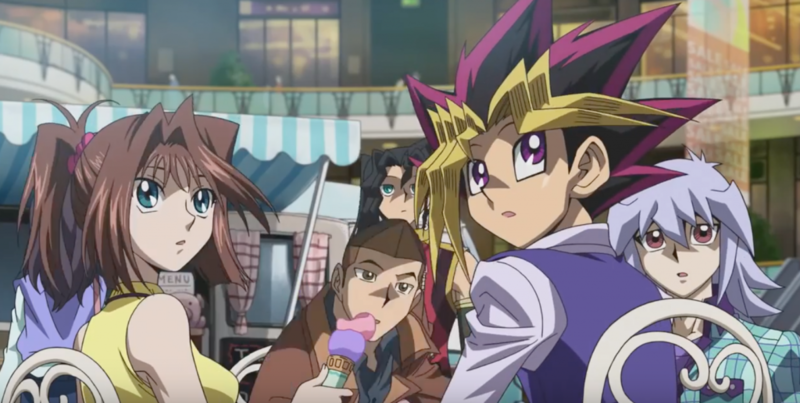 Although if you look closely in the trailer there is a scene where Yugi is finally wearing some new clothes! (Finally found the time to go shopping). Interesting choice of style but whatever floats the boat I say. So far all of the other characters look the same from their previous selves six months ago. Anzu (Tea) is sporting a ponytail hair style but otherwise facial features and style she is the same. Honda (Tristan), Bakura (Ryou) and Jounanchi (Joey) (not pictured) are also the same from what I have come across thus far. Now way in the back you see a small glimpse of Otogi (Duke). Notice the hair? Does it remind you of someone? Perhaps Yugi’s hair? 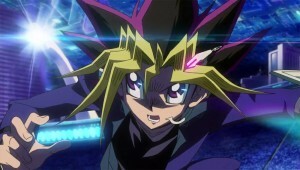 From what I am seeing he has styled his hair in the front almost exactly like Yugi’s. Crinkled side bangs on either side of his face plus that one strand that goes down the center. 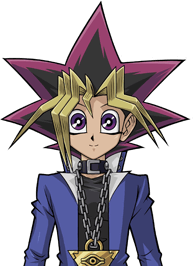 I had no idea Otogi was such hug fan of Yugi that he would style his hair like his. 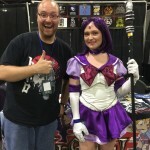 Last I heard he was his “own man” going out and promoting his Dungeon Dice Monsters game. It is nice to see him in the movie though. Many times he is a forgotten character. Notice the strand kid to the right? Any guesses? 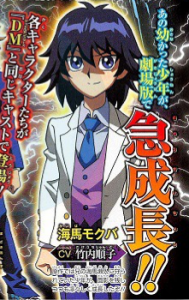 I was stumped for a while when I first caught a glimpse of this character… Mokuba? 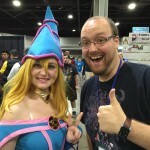 wait… Mokuba?! What happened? It’s not too bad when you put them side by side but it still is a shocker. I guess Mokuba was getting sick of his long hair so he finally chopped most of it off and got some “anti-volumizing” shampoo. Looks like he is following in his brother’s footsteps and trying to dress appropriately being that he is the next president of Kaiba Corp. if anything happens to Seto. One thing I have to ask: skin color. 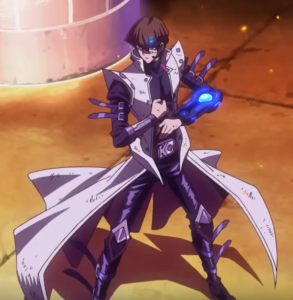 Did anyone else notice that Mokuba has fairly dark skin compared to his brother Seto? Or is this just me. I know they are supposed to be brothers but there are a lot of differences between them. I would never have guessed them to be siblings from the same marriage (the beauty of anime). Well if this skin color is true… Mokuba over the past few months has turned very white. Must be a harsh winter in Domino City. 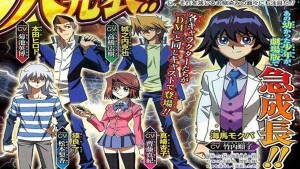 I’m curious to see Mokuba in the movie and his roll. I can guess that he is still carrying Seto’s monster brief case and cheering for his brother. I kind of wish he would develop his own character away from his brother. We saw this a bit in Season 0, but it never progressed. More than likely it is just a tease to get us to remember the great pharaoh. However, there are probably a lot of fans crossing their fingers to get a small glimpse of Yami Yugi coming back for the movie. I don’t think it will happen. If anything there will probably be a flashback but that doesn’t count. 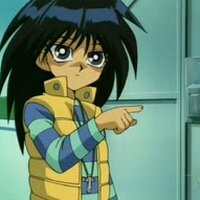 I think the fact that Kabuki Takahashi designed and changed Yugi’s features for the movie is a sign that Yami Yugi will not show up. Yuri has taken his place and is growing to be like his darker self but is also completely separate from him. I think that is what Takahashi is trying to point out to his audience in this movie. There are some other changes and rumors flying around but in the next few weeks as the movie comes closer and closer to airing we should be getting more info. 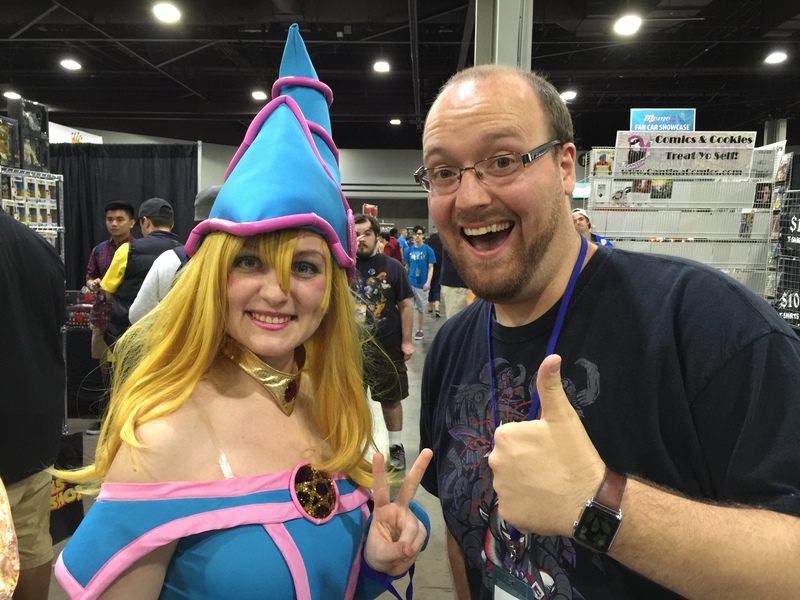 For instance, the Dark Magician Girl is pretty popular apparently in this movie and has three or four different transformations. 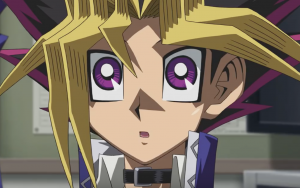 Yu-Gi-Oh the Dark Side of Dimensions will air on April 23, 2016 in Japan only (so uncool). Are you guys interested in the movie at all? What do you all think of the changes? 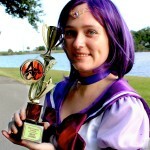 Duel on my fellow Yu-Gi-Oh fans!